Nothing seems quite so summery as peach cobbler. The sweet juiciness of a perfectly ripe peach tastes like a mouthful of sunshine. With this recipe, you can use thawed frozen peaches in place of fresh ones, allowing you to enjoy this seasonal treat all year long. Feel free to vary the amount of sugar to suit your own preference. For a nice finish, brush the crust with an egg wash (an egg white whisked with about 1 tablespoon of water), then sprinkle it with a little cinnamon sugar before you put it into the oven to bake. 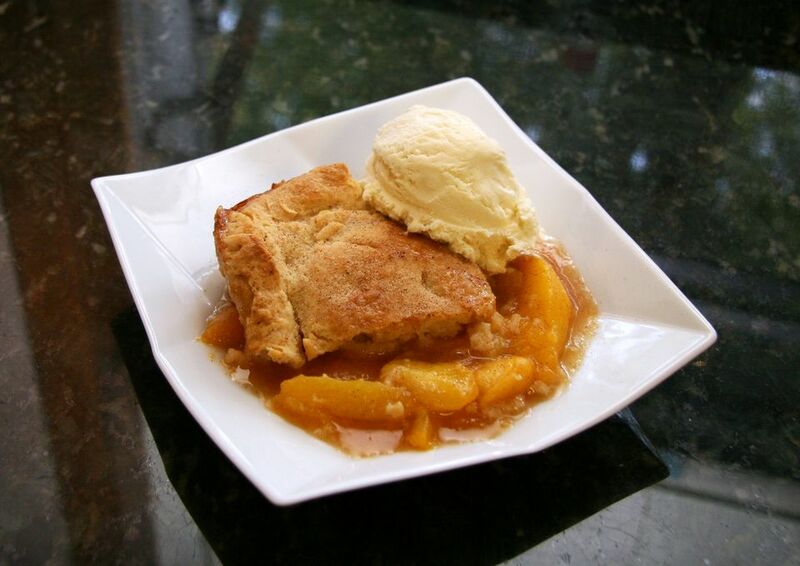 Serve the cobbler warm with the contrasting coolness of vanilla ice cream or whipped topping. Heat the oven to 450 F. Butter an 11-by-7 baking pan or 9-inch-square baking dish. Toss the peach slices with 3 tablespoons of sugar, the cinnamon, and the lemon juice; set them aside. In a medium bowl, combine the flour, baking powder, salt, and 1 1/2 tablespoons of sugar. Cut in the shortening and butter until well combined. The mixture should resemble coarse meal. Add the milk and mix just until the dough holds together. Put the peaches in the prepared baking dish. Roll the dough out just a little bigger than the baking dish. Fold it in half or quarters to make it easier to transfer to the baking dish; place it on top of the peaches on one end of the baking dish and unfold it to cover the other end. Crimp the edges around the baking dish, then prick the dough several times with a fork. Brush the top with the egg wash then sprinkle it lightly with cinnamon sugar. Put the cobbler in the oven on the center rack. Put a baking sheet on the bottom rack underneath it to catch any drips. Bake the cobbler for 10 minutes at 450 F. Reduce heat to 350 F and bake the cobbler for about 25 to 30 minutes longer, until it turns nicely browned and bubbly. Mix other stone fruits such as cherries, apricots, or plums with the peaches, adjusting the ratio to stay at a total of 4 cups of fruit. Add blueberries, which pair particularly well with peaches. Get creative and top each serving with a swirl of raspberry sauce for a peach melba cobbler or add a drizzle of Sriracha or your other favorite hot sauce for a surprising bite of spice.